Is Python the “best” first coding language? What can you build and what types of jobs can you get with Python skills? 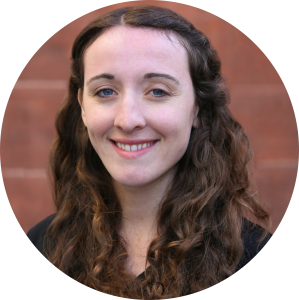 Meggie Mahnken, Senior Director of Education at Hackbright Academy, sat down with Course Report, a top online resource for intensive bootcamp programs, to explain the origins of Python, how Python is used by real developers, and why we teach Python at Hackbright Academy. Here’s everything a beginner needs to know about Python – plus some free resources to get started. Python is a backend programming language that’s great for beginners. Python is similar in many ways to Ruby, but is less verbose than other programming languages – a little less wordy. Python is approachable. Even if you haven’t taken a CS class, you can still write a useful tool in Python. It’s high-level, so you don’t have to deal with the lower-level aspects of programming, such as memory management. Python can be used for scripting, web scraping, and creating data sets. It’s popular in the scientific community for scientific computing; there are libraries that make it easy to share academic code projects in Python. Python is a web programming language, so it interfaces with the internet. It knows how to receive and send web requests and talk to databases. Python is said to be “loosely typed.” This category of programming languages doesn’t require you to state the type of value a function returns when you define the function or the type of variable before you create it. The Python community is welcoming, well-maintained, and well-documented. That’s important for a beginner! What are the origins of Python? In the mid-1980s a Dutch fellow named Guido van Rossum was working on an educational project to build a language for new coders called ABC. As a result of working on this project, Van Rossum became interested in language design, and that’s when he started working on Python. He made some unusual decisions, which really set Python apart from the zeitgeist at that time, and continue to make the language special today. One of Van Rossum’s decisions was to make indentation meaningful, which is unusual in programming languages. Critics who thought this would make the language hard to use didn’t receive the idea very well, but this feature is part of the reason why Python is both readable and popular. Good code style and readability is enforced by the way you have to write Python. When I first learned about indentation in Python, it struck me as a reason for the language’s success. Why is Python a great first coding language for beginners? Python is so readable that even if a company’s entire code base isn’t written in Python, developers tend to want to write code in Python. Hackbright mentors and alumnae tell me that even if they can’t always write in Python, they try to write smaller projects, internal tools, and automation scripts in Python. Python will be a marketable skill if you join any software engineering team because you’ll know how to create something that is well-maintained and well-received by your team. Python programmers are among the most highly paid, which is encouraging, especially if you’re considering starting a career in software engineering. Which frameworks wills I use with Python? Django and Flask are the most popular web frameworks with Python. Jupyter Notebooks are popular among scientists, folks studying machine learning, and people on the more academic side of computing in general. They let you share runnable snippets of code alongside explanations of what the code is doing. How do real developers use Python in their jobs? They write Python because that’s the back end language their company uses. That’s fairly common, but we do see a lot of graduates using Java, Ruby, and PHP, and others. 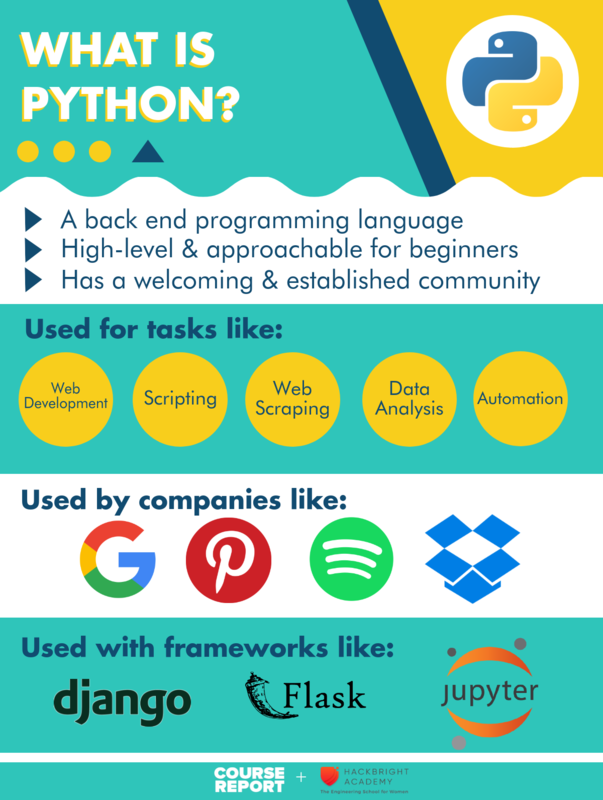 When companies don’t use Python for their main back end language, they might instead use Python to build scripts for deployment or other dev ops tasks, managing automation processes, cleaning up data, or migrating data from one place to another. Python is readable and fairly declarative, so it tends to be good for those one-off management tasks. Python is also a bit like super-glue – it’s good at connecting various different libraries, data sources, etc. as one cohesive tool or program. Most big companies use Python for something. Yelp is a well-known Python shop. The creator of Python works at Dropbox, and much of Dropbox is built on Python. What are the disadvantages of Python? Python is slower than other languages. There is a trade off between how high-level and abstract a programming language is and how efficient it is in terms of memory usage and space usage. Python is not low-level, so it’s not as fast or efficient as a compiled, lower-level language, like Java or Rust. It’s less common to use Python to build distributed database systems or other systems where speed is incredibly important. There are also some concerns about scalability, although I know that you can make Python scalable with different implementations of the language, such as PyPy. What are alternatives to Python? The most common alternative to Python is Ruby. Ruby is similar in syntax to Python, so much so that it can be hard to learn Ruby and Python one right after another. It’s almost like learning Spanish and Portuguese at the same time. It says “simple is better than complex, complex is better than complicated.” That refers not only to the code style guide, but also the high-level design approach that you should take when crafting a crafting complex system. Teaching Python helps our education staff encourage students to prioritize the pursuit of elegance, rather than trying to write the most clever or complicated program. Python lets students stop thinking about syntax and just focus on problem solving. Hackbright students are excited to learn those computer science fundamentals, and Python doesn’t get in their way. What kind of jobs can you get with Python? At Hackbright Academy, we focus more on back-end web development, so we see most of our grads getting standard web development roles like Software Engineers, Web Developers, and Front-End Web Developers, working in Python or in other languages. The protocols, tasks, and workflow you learn when you become a web developer will be a good foot in the door for technology jobs. We see a lot of grads going into web development first, then if they do eventually want to work in data science or scientific computing, then they can shift over once they’ve learned all of the core principles. A couple of Hackbright grads have gone into Data Analytics or Data Science. Maybe they worked on a dev team or as a business analyst before attending Hackbright Academy, so they already had some general experience, but they needed to know Python in order to specialize. Python is the language if you want to go into machine learning or data science, and it has an excellent set of libraries for that type of work. How can I start learning Python? Codecademy (free or paid): A good place to learn what programming is about and what it feels like. However, I think people need to go a little farther than Codecademy and hit some of the harder problems to know if they really like programming. Programming for Everybody: Getting started with Python by the University of Michigan on Coursera (free or paid): Great for folks who want consistent, comprehensive coverage of a topic. Actually, I originally got started in Python by taking a Coursera course. Think Python: How to think like a computer scientist (free): For people who like books or self-paced learning. The Hackbright Prep Course gives you a great introduction to coding before committing to the Immersive Software Engineering Program. You’ll go through fundamental principles like four loops, control flow, conditionals, data types. Hackbright Prep works particularly well for in-person learners, who need that face to face interaction to really understand a topic. Interested in learning more? Check out our upcoming Part-Time Prep Course in San Francisco and our immersive Software Engineering Program. Hackbright Academy offers a deferred tuition program to select, eligible students. This post was originally published on Course Report. Find more bootcamp news and read Hackbright Academy reviews.